Blessed Homemaking: Attitude Adjustments, Keys to a Queenly Castle, and Giveaway! Attitude Adjustments, Keys to a Queenly Castle, and Giveaway! I don't know if I've ever mentioned this before, but I feel just so absolutely blessed to be a part of the Gabby Moms. I just have really grown to love Mrs. Lorrie Flem, as she is just that older woman that you would love to have mentor you in the ways of being a wife, homemaker, mother, and homeschooler. She is just bursting with wisdom, and she speaks plainly (and truthfully! ), but at the same time is kind and sweet (and has such a sweet voice too). I'm not trying to butter her up, I truly mean this. Mrs. Lorrie Flem has such a clear vision and understanding of Biblical womanhood, and I have come to believe that any resource she puts out will encourage you in being a more godly woman. Well she has done it again this month with 2 resources I was so blessed to review! This time it was 2 audios from Eternal Encouragement that were oh, SO convicting and helpful at the same time. The first was Attitude Adjustments. Do you know that saying "Ain't nobody happy if Momma ain't happy?" I have only heard that used in a negative way in my life--that everybody better keep Momma happy or else. But Mrs. Lorrie Flem uses this saying in a different way (or perhaps the correct way that I never heard used)--that Momma's attitude affects everyone around her. In other words, Momma has the ability to change those around her for the better (or worse). I wrote a post similar to this awhile ago titled "Momma Sets the Tone of the Home", so of course I couldn't agree more. It was also so wonderful to receive so much encouragement to have a good attitude as a wife, mother, and manager of my home. 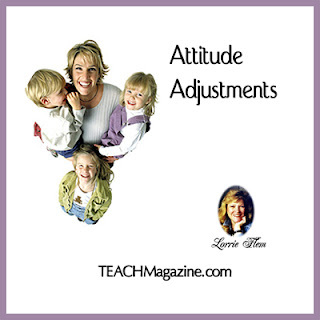 Lorrie explains how we can change and control our attitudes. The second audio I got to listen to is Keys to a Queenly Castle. In this audio, Mrs. Lorrie Flem points out how God has given us charge over our homes and how realizing this (and many other things), will help us to have a "queenly" attitude about our work at home. If you believe your work at home is important, you will be greatly encouraged and strengthened. If you are doubtful of your significance, you will receive the information and encouragement you need to wake up every day feeling like, and having the attitude of, a queen, instead of a "housekeeper". (My apologies that I cannot get the picture to upload for the second audio, but you can see what it looks like by just visiting the link). I highly recommend these resources and know you will love them too. 3. Winner will be chosen on Saturday, June 18th via random.org. 5. Winner will have 48 hours to respond to claim prize or an alternate winner will be chosen. Have fun and I really hope you win! Don't miss a post~get Blessed in your inbox! I so agree with you about Lorrie. God has blessed her with a love and passion for wives/moms! I'm glad I've gotten to be a part of that too! Mrs. Lorrie Flem sounds like a very knowledgeable and encouraging lady in regards to biblical womanhood. I'll have to check-out her audios sometime in the future. I'm not going to do the drawing because, well, I never win on those things anyway, ha, ha! I've enjoyed listening to this month's two audio recordings as well! I liked your review. Thank you, ladies. She really is a blessing! Great post and congratulations on 1st place!